A quick recap of the crummy weekend for local sports fans: The Yankees lost two out of three to Boston after blowing a ninth-inning lead last night, and not only did the Mets lose two out of three to Atlanta, both Jose Reyes and Daniel Murphy left yesterday's rubber game with injuries. But baseball fans aren't the only ones who had little to be excited about this weekend: The Football Giants, a team already having an unspectacular off-season made worse by the one their rival down the Jersey Turnpike is having, got two pieces of bad news. On Saturday, they learned that first-round pick Prince Amukamara, who'd already missed the first week of camp because of contract negotiations, broke his right foot. He'll have surgery to insert a screw into his foot, and according to the Giants, will be out an "undetermined period" of time. (For what it's worth, offensive tackle Will Beatty had surgery for the same injury last year, and missed eight weeks, including the bye.) The Times, perhaps attempting to give fans some hope to cling to, notes that some players are able to return within three weeks of surgery, but it's nevertheless a blow to the team's cornerback depth. (They'd also already lost Bruce Johnson, who ruptured his Achilles.) 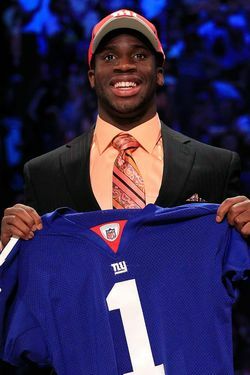 Amukamara, by the way, didn't yet know when he'd undergo the operation. Monday: Giants sign tight end Ben Patrick. Friday: Raiders sign former Giants right end Kevin Boss.